Exactly one child sits in each chair. No boy sits next to another boy. Ivan sits next to and east of the fourth child in the row. Sylvia sits east of Ivan. Frank sits next to Ruby. What is the maximum possible number of different pairs of chairs in which Frank and Ruby could sit? Both Harry and Joel sit east of Frank. Both Harry and Ruby sit east of Frank. Both Harry and Joel sit west of Frank. Both Harry and Ruby sit west of Frank. Both Joel and Ruby sit east of Frank. If Thelma sits next to Ivan, and if Frank sits next to Thelma, which one of the following statements could be false? Both Frank and Ivan sit east of Ruby. Both Frank and Ruby sit west of Thelma. Both Frank and Sylvia sit east of Ruby. Both Frank and Thelma sit west of Sylvia. Both Frank and Ruby sit west of Joel. If Frank does not sit next to any child who sits next to Ivan, which one of the following statements could be true? Harry sits west of Frank. Joel sits west of Ivan. Ruby sits west of Frank. Thelma sits west of Frank. Thelma sits west of Ruby. 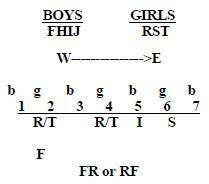 If Frank sits east of Ruby, which one of the following pairs of children CANNOT sit next to each other? 1) Which children must, can, or cannot sit east and west of which other children? 2) Which children sit next to which other children? The Initial Setup: Since the east-west thing seems to play a big part in the questions, there’s no harm in jotting down a W and E to remind yourself at a glance which children are east of and west of each other. Get the boys and girls down on the page, throw in seven chairs, and you’re ready to see how the seating arrangement will be determined. 1) Talk about strict. No fun for these kids; one kid per chair. Just a loophole closer that you most likely assumed anyway. 3) Here’s the most concrete rule of the bunch, one that you may have jumped to right off the bat: It requires a touch of interpretation, but essentially means that Ivan is 5th. Chairs 5, 6, and 7 are the chairs east of chair 4, and the only one of those next to 4 is 5. 4) “East of” in this set means to the right, so this boils down to our usual sequencing notation I . . . S. Perhaps you thought this through in accordance with the deduction stated above. We’ll hold off until Step 4 and deal with it in Key Deductions below. 5) FR or RF must appear somewhere in the ordering. The major challenge of Q. 1 is figuring out exactly what they’re looking for, so a careful reading is in order. First of all, what is a “pair of chairs in which Frank and Ruby can sit”? Let’s check it out: We see from our sketch that Frank can be in chair 1 with Ruby in chair 2, so chairs 1 and 2 together count as one acceptable pair for this couple linked by Rule 5. Keeping Ruby in 2, Frank can move to 3 without a hitch, so there’s a second pair, chairs 2 and 3. But Ruby can also be in chair 4 when Frank’s in 3, so 3 and 4 together counts as our third pair. Any others? Nope, so three it is, choice (C). Next we’re to find a statement that must be false, which means that each wrong choice will either be true or possibly true. Notice how all the choices involve Frank, which is nice because we know plenty about Frank’s prospects. In fact, simply recognizing that Frank can be in the first chair allows us to kill choices (A), (B), and (E), since if Frank were to take chair 1, everyone would be east of him. Upon analysis, we see that (C) is the impossibility we seek: We deduced up front that Frank must sit in either chair 1 or 3. But even if we slide Frank down as far east as possible—that is, chair 3—there’s no way to fit both free agents Harry and Joel west of him, considering that either Ruby or Thelma must take chair 2. (D) is possible: One of our boy floaters, in this case Harry, can certainly hang out with Ruby on the west side of Frank—H in 1, R in 2, and F in 3 would do the trick. But we can’t get both Harry and Joel west of Frank. As mentioned above, one of those guys has to be in the easternmost chair 7. Good solid info is offered in this one, so here’s a perfect time to use your pencil—get it all down in a new sketch. Ivan’s in chair 5, so if Thelma’s next to him, she must be in chair 4, considering that we’ve already slotted Sylvia for chair 6. The stem also tells us that Frank is next to Thelma, so put F in chair 3, which leaves R for chair 2. Free agents Harry and Joel will float between chairs 1 and 7. We’re looking for something that could be false, and we can shorten our work by scanning the choices for Harry and Joel; after all, they’re the only ones not fully restricted here. Only Joel appears, and way down in choice (E). Lo and behold, Joel’s elusive nature does in fact make (E) the correct choice. (E) would be true if Joel’s in chair 7, but would be false if Joel’s in chair 1. If you’re not convinced yet as to the importance of the Frank deduction, here’s another question that falls pretty easily thanks to the fact that Frank must be in 1 or 3. If Frank took chair 1, he wouldn’t be east of Ruby as the stem demands; so Frank must sit in chair 3 with Ruby in chair 2. That again lands Thelma in chair 4 (familiar territory for her), which again leaves 1 and 7 for Harry and Joel to fight over. Again, everyone’s placed but those two. From this ordering, we can see quite readily that the only pair that cannot be next to each other is the duo of Ivan and Ruby—Frank and Thelma come between them. Choice (A) contains folks that are next to each other, while the others contain pairs that could be, depending on where Harry and Joel sit.